Now, this comic book I know was purchased for my brother Ken, as at this point I was still an avowed Marvel-hater, and even reading SUPERMAN VS THE AMAZING SPIDER-MAN had not swayed me. It’s worth noting that this issue still cost a quarter, whereas DC’s books were going for thirty cents at this time. This was a consistent pattern all throughout the 1970s, another way in which Marvel kept up a competitive edge over DC: when a price increase was in the offing, DC inevitably would raise theirs first, and Marvel would hold the line for approximately another three or four months. This gave them a huge window in which prospective buyers were more likely to pick up a Marvel mag, and contributed to the company’s growth throughout this period. I was familiar with the basics of Spider-Man from the 1967 cartoon, which ran daily on Channel 5 at 4:30, and which I seldom missed. I’d also look for the wall-crawler on episodes of the Electric Company, the PBS series that I was absolutely addicted to at the age of nine. But still, I wasn’t a Spider-Man fan. He seemed entirely too put-together, entirely too with-it to me. He was definitely way cooler than I was, and I simply couldn’t relate. 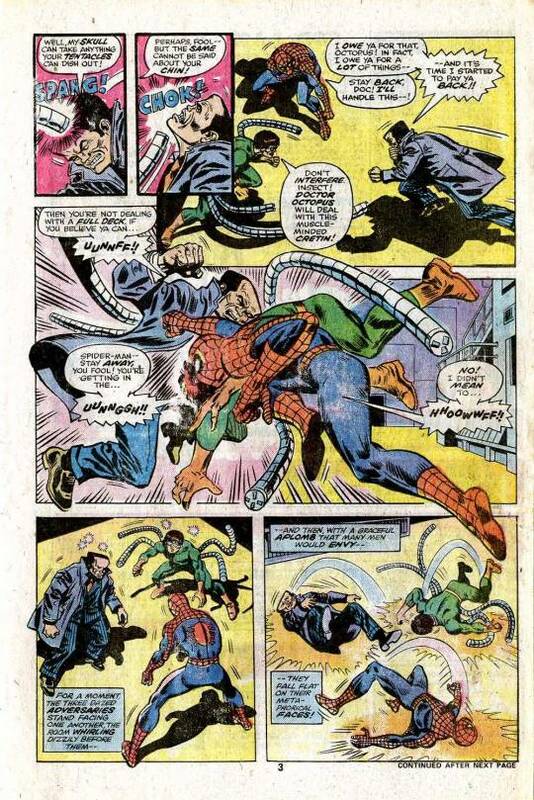 It would take reading the early Stan Lee/Steve Ditko stories for me to “get it” and become a fan. But at this stage of his development, Spider-Man was about as far from that original conception of nebbishy Peter Parker as he ever got. This is another action-heavy entry in the canon, one that features no Peter Parker moments at all, just the smart-mouthed wall-crawler. It opens, as most Marvel books of this era did, in mid-story, as Spidey and his enemy Doctor Octopus were confronted by a resurrected Hammerhead. I was familiar with Ock from the aforementioned SUPERMAN VS book, and Hammerhead didn’t seem like much of anything to me, a gangster with a steel-hard head. Even by Flash Rogues standards, that was pretty lame. So Spidey, Ock and Hammerhead get into a three-way skirmish, the end result of which is that all three of them wind up knocked out. Hammerhead’s goons use the opportunity to grab up their leader and take a powder, also taking Spidey’s Aunt May along with them. 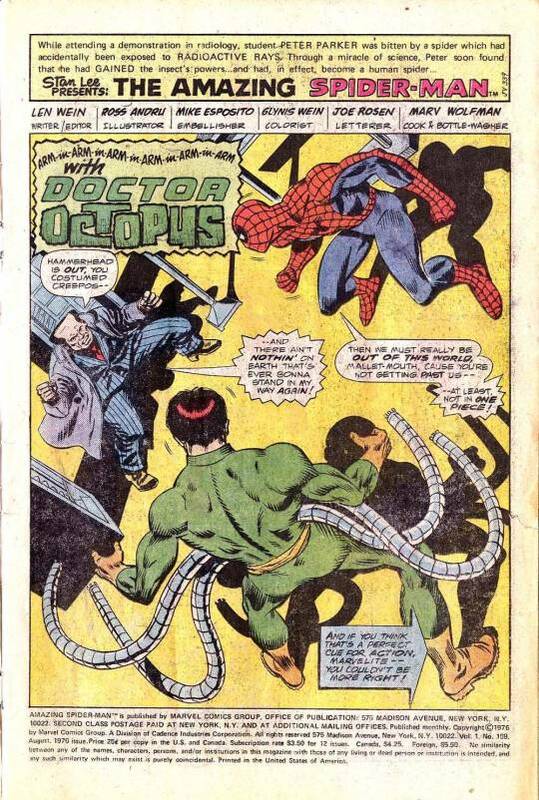 Waking up, Doc Ock proposes a truce with his web-headed arch-enemy so that they can rescue “that dear old woman”, which Spidey, of course, is all for. From there, we move into subplot land, where a pair of shadowy figures is rebuilding the Spider-Mobile and intend to use it to destroy Spider-Man (which, again, doesn’t seem especially threatening.) 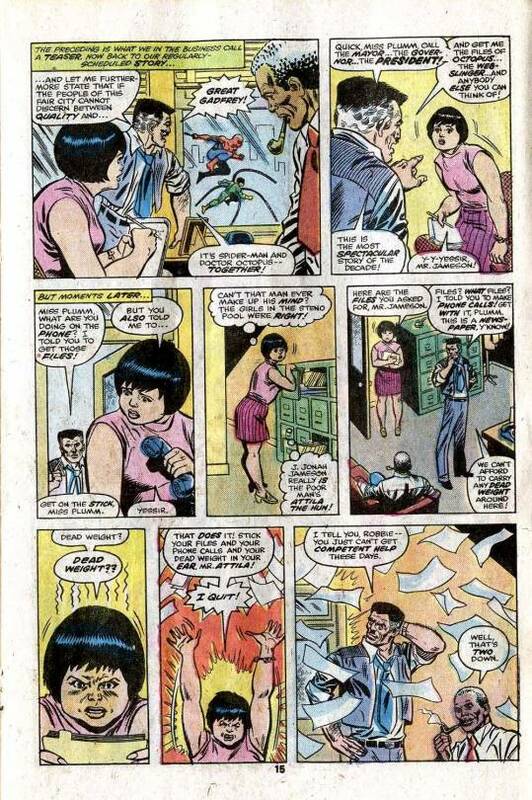 From there, we cut back to the Daily Bugle for an out-and-out comedy moment, where J. Jonah Jameson drives another of Betty Brant’s replacements as his secretary to quit through his abuse. This is the sort of fun moment that doesn’t contribute to the plot but is all about the characters and fun that you don’t really see anymore. Back at the ranch, Spidey and Ock follow Hammerhead back to his warehouse headquarters, and begin an infiltration–again, played with a certain amount of comedy as much as drama. 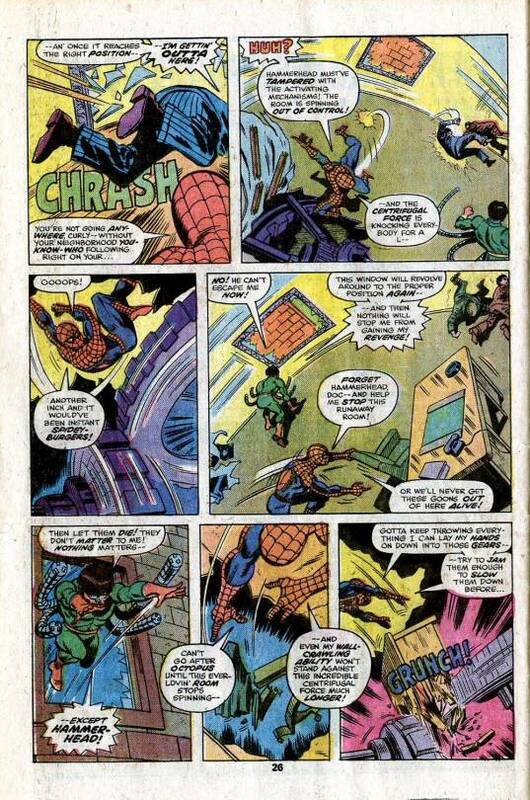 This is an old base from a previous story, not that I was aware of it, and the entire inner chamber revolves–so when Spidey and Ock burst in on Hammerhead and his captive Octogenarian, he summons an army of gunsels into the room and sets it to spinning, creating some action pandemonium. Spidey and Ock beat the hell out of the goons, but Hammerhead takes advantage of the chaos to escape–and Ock deserts Spider-Man to go after Hammerhead, obsessed with revenge. Spidey eventually disables the equipment that is spinning the room–but when he does so, the window exit that Ock and Hammerhead went through is facing a blank wall, so he cannot follow. Perhaps that’s just as well, as by the time Ock gets to the roof, Hammerhead is making his getaway in a helicopter. Undaunted, Ock picks up a bunch of garbage cans with his tentacles and hurls them at the escaping copter, one of them disables the flying rotors, and the whole mess crashes down into the Hudson River. By this point, Spidey’s been able to get himself and the unconscious Aunt May out of their spun-room prison, but he can’t pursue Ock as he needs to get her to medical attention. Which he does, closing the issue by swinging off into the night. I can see why this didn’t work for me at the time–there’s nothing to grab onto. Spidey is Spidey 100% of the time, and nothing in this story makes me care a whit for Aunt May and her fate. 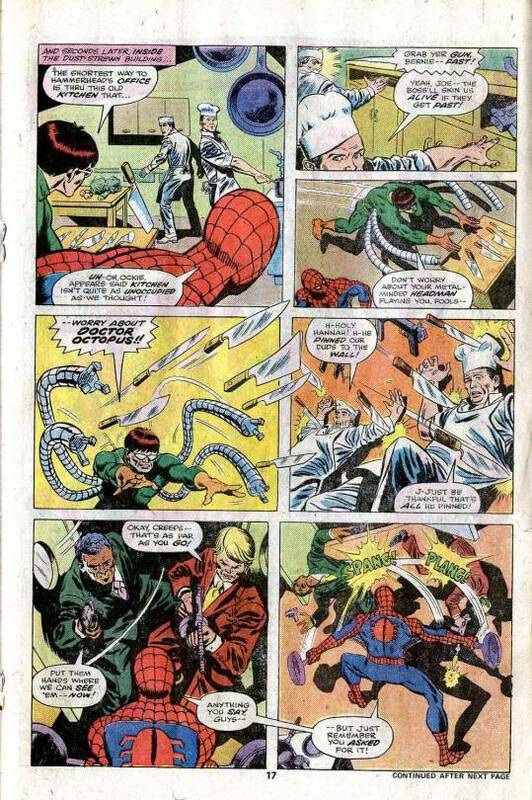 Plus, frankly, for all that he’s clever and sharp, Spidey doesn’t really accomplish much in this episode. He gets knocked out, he fights a bunch of guys, he lets Doc Ock escape and Hammerhead get killed because he misjudged the room-spin. Sure, this could all be in illustration of the idea that Spider-Man is a fallible, human hero, but that’s not really what came across to me. He seemed more like a goon. Combine that wit the fact that the plot for the issue was pretty much just an excuse to string some fight scenes together, and none of this made me want to give the Marvel books another go–not yet. That was still to come. 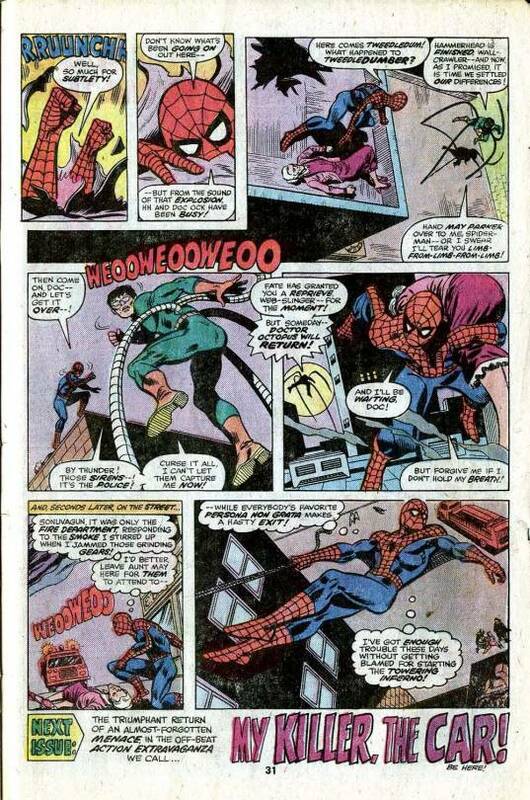 This was, it must be said, not the finest period in Spidey’s long publishing history. 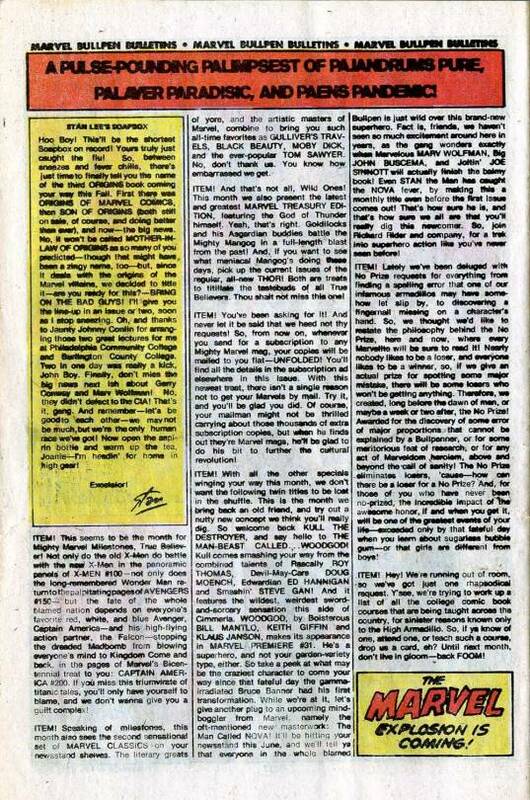 The issue also had a Marvel Bullpen Bulletins page, but rather than interesting me or exciting me about stuff that might have been coming up, it did the opposite–it made me feel like an outsider. Whoever wrote this particular page (apart from Stan’s Soapbox, which would have been by him) filled it with in-jokes and references, and spoke as though the readership knew who all of these characters and creators were. I certainly didn’t, and so I was lost. And the tone was so aggressively hype-filled, it was like an assault on my senses. The one bit I can remember enjoying was Stan’s gag about the third ORIGINS paperback being titled MOTHER-IN-LAW OF MARVEL ORIGINS. Even there, though, he’d provided enough context for the joke by listing the two previous titles first. Stan knew what he was doing.